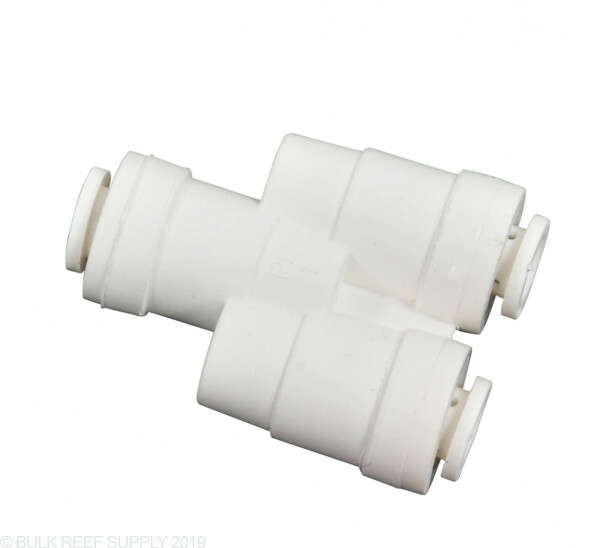 We believe GA Murdock Mur-lok fittings to be the best so strongly that we use them virtually exclusively on each of our BulkReefSupply.com reverse osmosis and BRS media reactors. Worked much better than a tee for my application. High Quality Product. I bought this in conjunction with the directional valve to reduce the amount of TDS going into my DI unit, known as "TDS Creep". See BRS video for RODI upgrades. Never a problem with these connectors. Small part that can cause big problems like the ones in the hardware store have made for me. Helps ease plumbing issues, takes less room that tees, cleans up that plumbing mess. Had used a lot of fittings from the local home centers and have had problems with leaks. Started buying these here and have had no problems....and they do not cost any more here than at H.D. Great quality, price, selection, and customer service!! This splitter has to be the best way to split your water line. A "T" will slow the water down and send your tubing in different directions. This one is inline and keeps the flow going in the same direction. Plus it has the mur-lok double O-ring connections. I bought this product for the 150 gpd but they do sell the kit! Go buy the kit! I'll never buy push connect fittings elsewhere again! The mur-lok splitter does what it should...split the water line without a leak. The double "O-ring" style really makes the difference as does the design of this splitter. Works just like Cable TV. One in, Two Out. No right angles to slow water flow. A lovely MUR-LOK RO TUBE DIVIDER everyone should own one. i have the 75 GPD RO/DI 5 Stage *PLUS* System and i used the Tube Divider to hook up my two clean water cans so it is easier to mix my salt at the sametime. Does this allow flow in either direction? In otherwords, 1 line in and 2 out or 2 lines in and 1 out? I am thinking about adding a second membrane to my 4 stage RO unit and at some point I need to combine my lines before it goes through the DI chamber. A tube divider is just like a tee, it is just an open tube on the inside. There is no in/out designations and water can flow in any direction. This is exactly what we use on our own dual membrane systems to tie the product water lines together.